I am hoping someone might know a source for these, I have run out of luck in finding any. 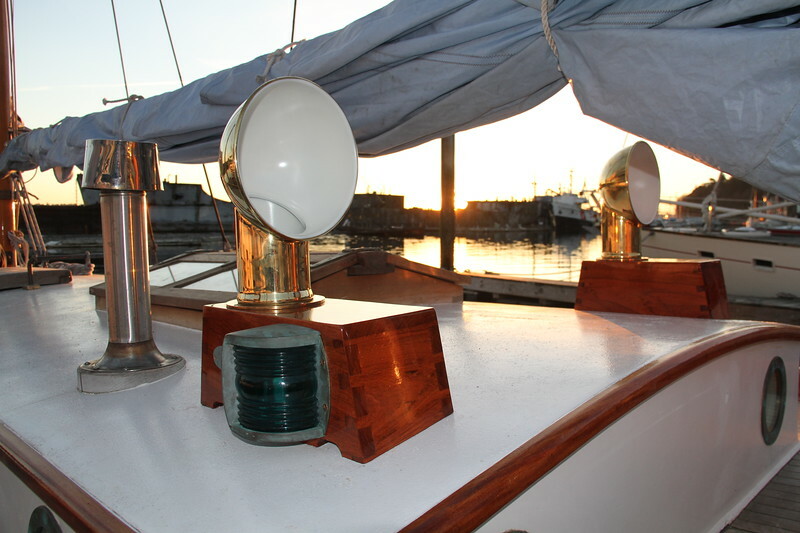 Aside from the ABI coated ones that look like a pristine bronze but will never attain the beautiful patina (ahem, tarnish) of the rest of the hardware on my catboat, only tall ones seem to be bronze. Ideally I need something under 4.75” in height. Basically like the common pvc or stainless low profile shape, but in bronze. I would consider custom built but I don’t know where to find that option either. You might go through Port Townsend Foundry's listings. I see they have several fairly tall ones and some nice clamshell style ones as well. You might go through Port Townsend Foundry's listings. But if you are smart you won't. Their website is the biggest piece of garbage on the Internet. Ebay seems to have everything, eventually. There are a few good marine consignment stores around too. I'm thinking of using a mushroom vent on my lazarette hatch. Well, I hesitate to say so, but I have a 1982 marshall 22. Yes it is fiberglass. In my defense, given her design and character I have found much more useful information on this forum than others (which seem to be for modern cruising boats with little in common with the Marshall aside from plumbing). The catboat association is wonderful but not very active in online discussions. Here is a picture anyhow, in the hopes I will not be flamed for the fiberglass (although perhaps there I'll have an advantage over wood ). The vents I am hoping to replace are the white PVC cowl vents just outboard of the cockpit coaming and ahead of the stern cleats. These vent the engine compartment and engine bilge (which is separate from the cabin bilge). Last edited by mpoor; 03-26-2019 at 09:33 AM. I had looked at those mushroom vents, there are some beauties out there, but I need to have these venting all the time- can one leave a mushroom vent open 24/7? I was thinking of ordering brass or bronze bowls from India, where they still make such things, and cutting and bronzing to a short stack. Never got it done, though. If you made 6 or 8 it would pay for itself. I'd buy a pair. Yes, you can leave it open 24/7, but it will not scoop up as much air as cowl vent. Very good at letting moist air out however. The threaded detail may require some thinking and planning. is the most knowledgeable, person I know of in the marine foundry trade! Pete is both honest and extremely creative when it comes to replicating a traditional piece of marine hardware. That is why people from all over the world seek his services! Port Townsend has an articulating mushroom vent that would look pretty nice, not sure that it would function as well as a cowl however. They have beautiful stuff. They have other designs too. That boat is a peach. A few of my classic boat friends own catboats, some glass, some wood. I don't think that the mushroom will vent as well as a cowl, but certainly better than nothing. Let us know what you find. Obviously sir, you know very little about The Port Townsend Foundry and their staff! Their Products are unparalleled! That may very well be. But their website is unparalleled garbage. Thanks Breakaway! Those are very pretty, but I'd feel better with something raised slightly off the deck. Casco bay has a fair amount of wake from all the tugs and lobster boats so sometimes a wave will come along the side deck there. They are a total height of 4.9" and the PVC ones I have are 4.5", so I think they might work. They don't rotate but that's ok for my application. Last edited by mpoor; 03-27-2019 at 09:02 AM. Easy enough to fabricate a spacer to lift one of the clamshell vents off the deck an inch or two. Expand your search to include brass and you will have more options. I ended up with brass cowls and have been very happy with them. The pricing is considerably better as well. How are brass ones faring to date? How long have you had them and how much have they been through? I'm curious about them as well. I've only had them installed for about a year. They are fairing well. They are a bit more green now, though not totally green and they haven't been polished at all. Frankly they are doing a lot better than the varnish on the dorade boxes, which I need to get after asap. I expect long life (decades) from them. They'll probably be murdered by an errant jib sheet or something long before they corrode. I do have deck plates to fill the holes if I want to remove them in the worst weather. Here is a vent made by Davey & Co. of Great Britain. The funnel can be turned any direction or removed when necessary. It took me a while to remember. They do make good bronze hardware. How much were your brass ones, J. Madison ? They look pretty nice. Made out of sheet with spun cowls but still nice. The brass ones are sheet and were about $160 each or so. Having done some bronze casting, I think I'd charge $700 a vent too! Granted, there is no way I could ever pay that, so for me it was a moot point. The cast ones sure are nice though. I'd probably hesitate to tie up some places with jewelry like that. Looks like West Marine is selling the exact same sheet brass ones for $999!!! Granted, they come with the deck fitting but that is still obscene. Somebody should import a container of them from Alibaba, that looks like the best deal! Last edited by J.Madison; 04-01-2019 at 11:13 PM. Looks like West Marine is selling the exact same sheet brass ones for $999!!! Somebody should import a container of them from Alibaba, that looks like the best deal! I was pretty much a rah-rah buy local person until I got so disgusted with Amurrican businessmen. Greedy worthless bastards is what they are. We deserve to have China trample us. That is a shock! But, in defense of the Davey Company, I know that labor, materials and export costs are going up everywhere. That is probably why the company has been forced to cut back on many of their products that were once readily available. Even so, they do make good products! They are the only source of Jefferie's Marine Glue for paying deck seams that I know of. They supplied the Brittish Navy with it back in the days of wooden ships and iron men. The Port Townsend foundry can supply them as well. But I have no idea of their price for a two piece funnel vent. They have always been fair with me in the past. I once made a sheet metal funnel when I was taking metal shop in high school. If I can find the pattern I saved I will post it. Quite frankly, if I made one now, I would charge close to that shocking price that we are prattling about as it was a hell of a lot of work to make it! I remember it as being made of five brass plate hoops that tapered in size. The job required rolling a wire edge on the opening, silver soldering the hoops closed, hammer beveling the connecting flanges on a round stake and soft soldering it all together into each other and into the deck ring. I was seventeen then and it took me nearly a month to make it! I got a good grade on it and my dad was happy to get it as a present as the old one had been turned to scrap by the main sheet on the family boat. Last edited by Jay Greer; 04-03-2019 at 12:37 PM. Sure, but the funnels pump in a whole bucket of wind. Much more than a clamshell. I am of the camp that you can't have too much ventilation on a wooden boat. I found two places that supposedly make them, both the round style, an elliptical style and the squatty style like the op originally posted. Headed that way in a week so I'm going to order myself a pair of the rounds in bronze. If anyone else is interested pm me. Should have prices in a few days. definitely not $999 ! @Jay - yes, prices are going up all over. Why ? We aren't getting any more for our money so, why ? btw J, I have the kind you made now, but would like a pair of the cast bronze ones. Shiny shiny, shiny boots of leather ! Very pretty, but at 7" high off the deck they are too high. Anything close to the cockpit coaming is asking to snag the giant mainsheet that catboats have, I want to stay as low as possible. Last edited by mpoor; 04-10-2019 at 11:25 AM.